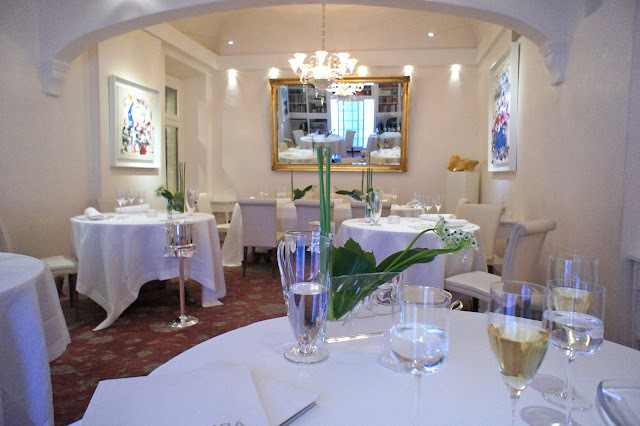 Arnolfo is a 2 Michelin star Italian restaurant in a small town an hour's drive from Siena. The village of Colle di Val d'Elsa is on a hill and apparently in the day, has very nice views of the surrounding areas. Unfortunately we got in too late after dark and missed it. The restaurant itself is located along a very narrow street (it is the main street for the old town, though) and parking nearby is a bit of a problem. 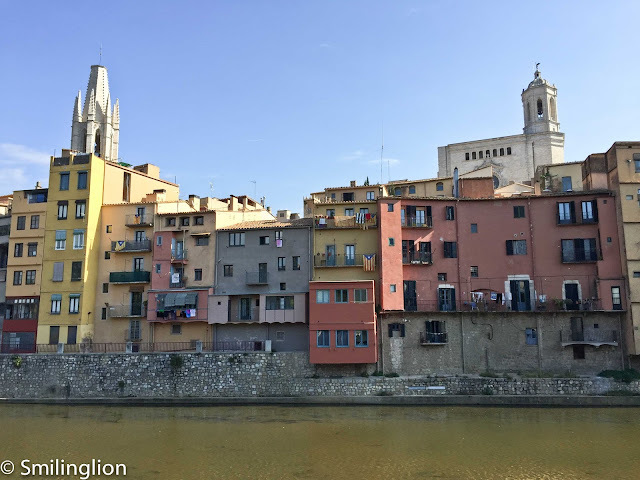 We made one long detour before deciding that it was prudent to park at the public car park just before the old town and walk the 300m to the restaurant instead. The restaurant is run by two brothers: Gaetano Trovato who is the chef, and Giovanni Trovato who is the sommelier and runs the restaurant (their website has particularly nice pictures of their food). Both brothers were very personable and spent a lot of time during our dinner chatting with us. The dining room was very bright and spacious with comfortable seats, modern art on the walls, a bronze mirror which made the room appear larger and a huge Persian(?) carpet on the ground. Throughout the night they were playing a mix of classical and contemporary lounge music. They had a decent wine list (though not very extensive) from which we pick out a 2001 Camartina di Querciabella, a Supertuscan which was absolutely spectacular, at a decent price. The first amuse bouche was a line of melon with bacon bits, sea bass cream, veal tartare wrapped with cucumber, a white bean on red onion and sliced octopus. 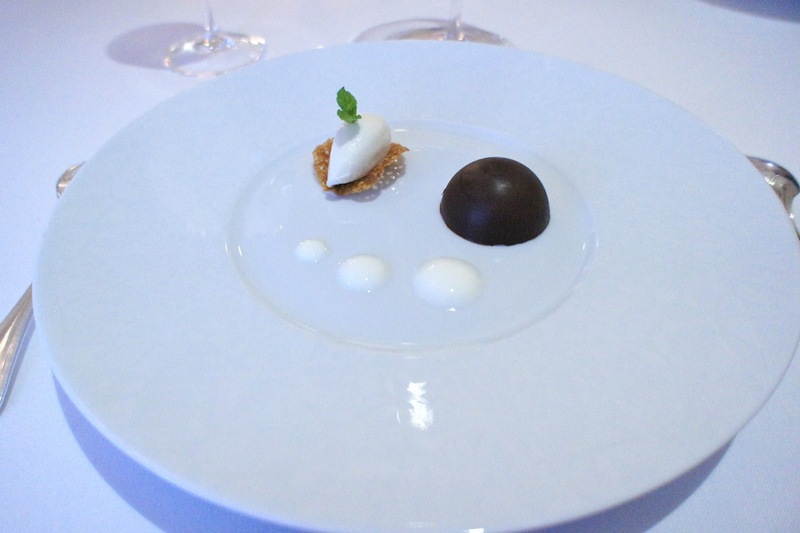 We particularly liked the white bean on red onion. 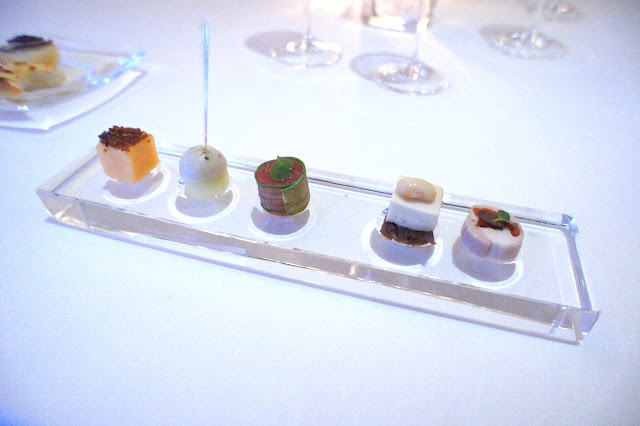 Second amuse bouche was a very delicious rabbit and mushroom with rabbit foam which was excellent. 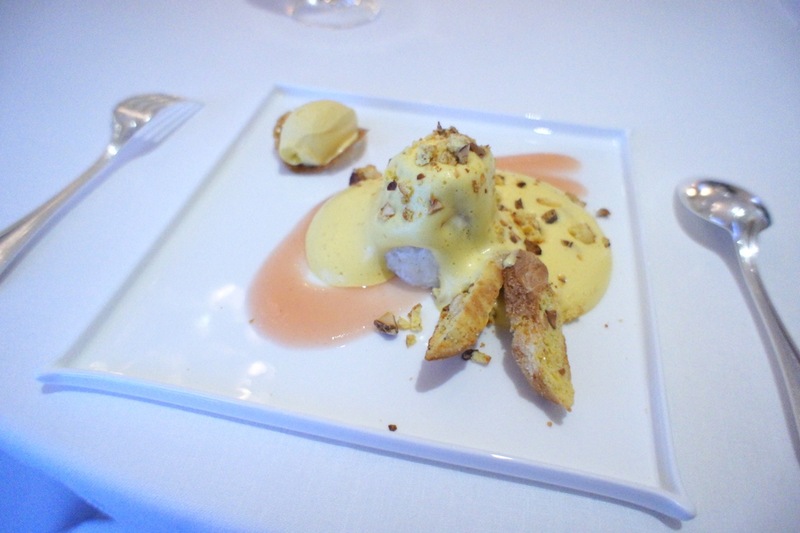 My wife and I both picked separate menus: I chose the 'Discovering Tradition' menu, which was the traditional meat-based menu whereas my wife went with the 'Contemporary Moments' menu, which was mostly fish and seafood. 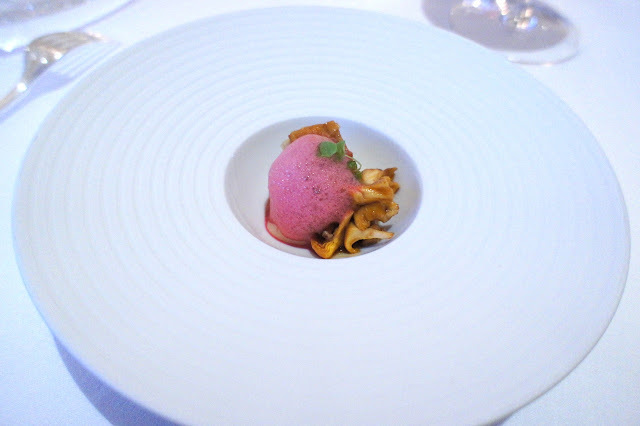 Cabbage: Brocoli, Cauliflower, Leaf Cabbage - This was a refreshing start for me. 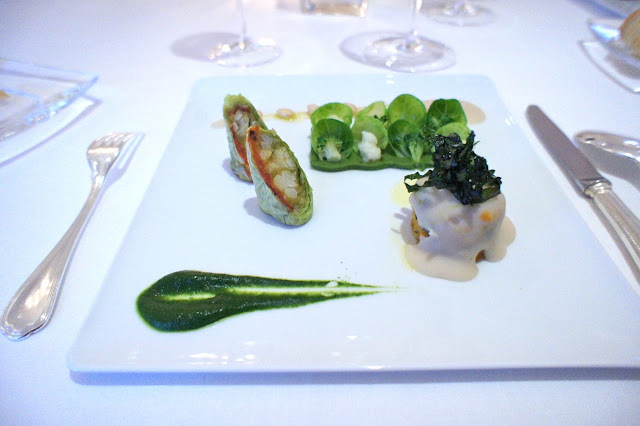 Lots of leafy greens which were light yet tasty. 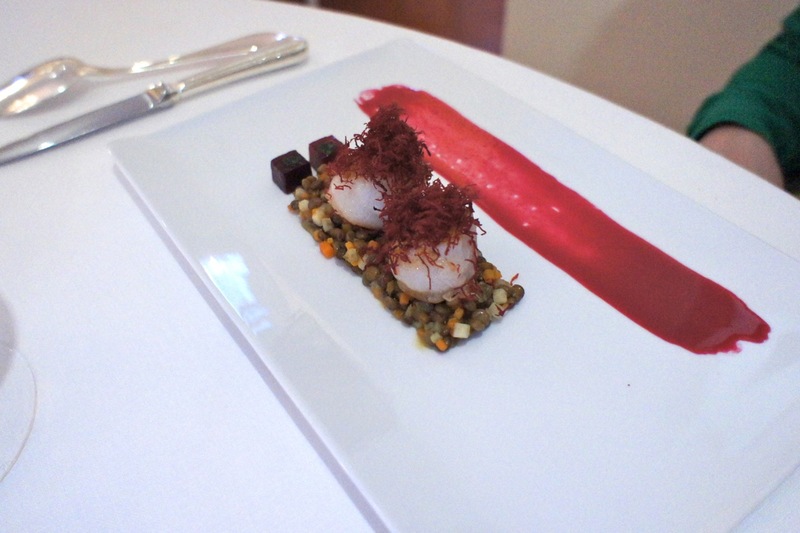 Scallops, Lardo from Colonnata, Lentils, Beetroots - My wife started with this. The scallops were really fresh, plump and juicy, and went well with the lentils. 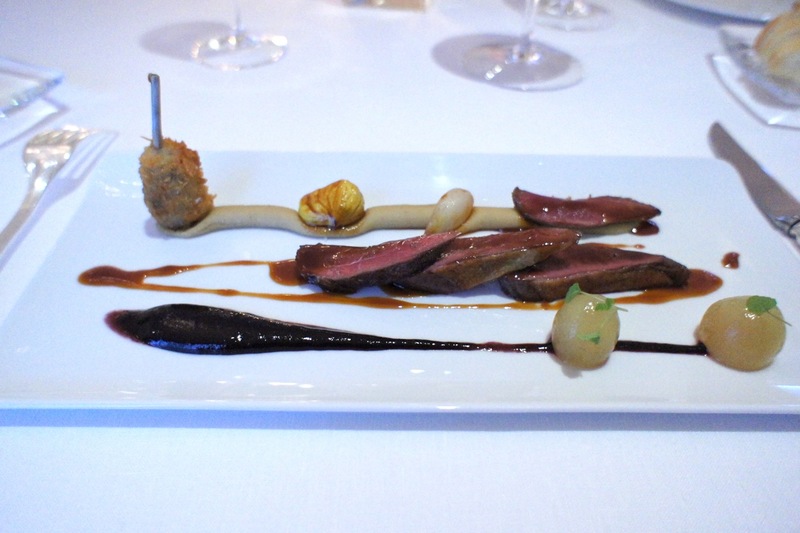 Pigeon: Breast, Leg, Grapes, Chestnuts - I thought this was brilliant. The pigeon was cooked to perfection and the sauce was sublime. 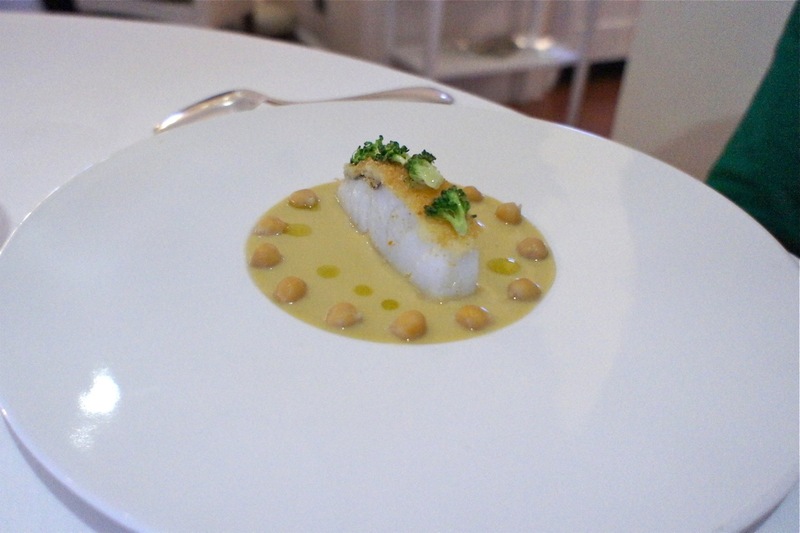 Cod, Chick peas, Broccoli - My wife thought the cod was very nicely cooked, though she did not generally like chick peas. 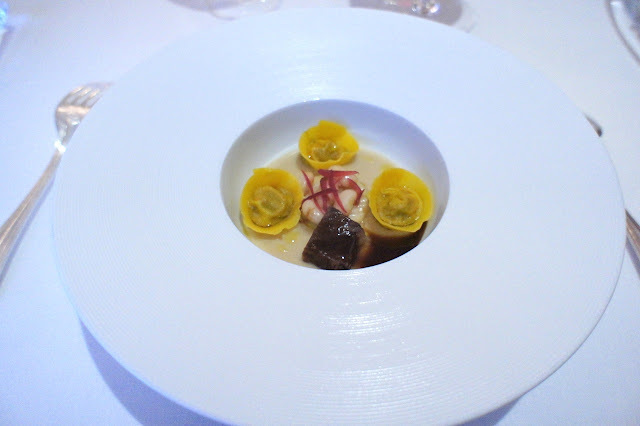 Cappelletti, Chianina Veal I.G.P., White Beans, Red Onions - This was a very elegant pasta dish which I had, and the Chianina veal was braised nicely and not over-marinated such as to overpower the pasta. Blu Lobster, San Gimignano D.O.P. 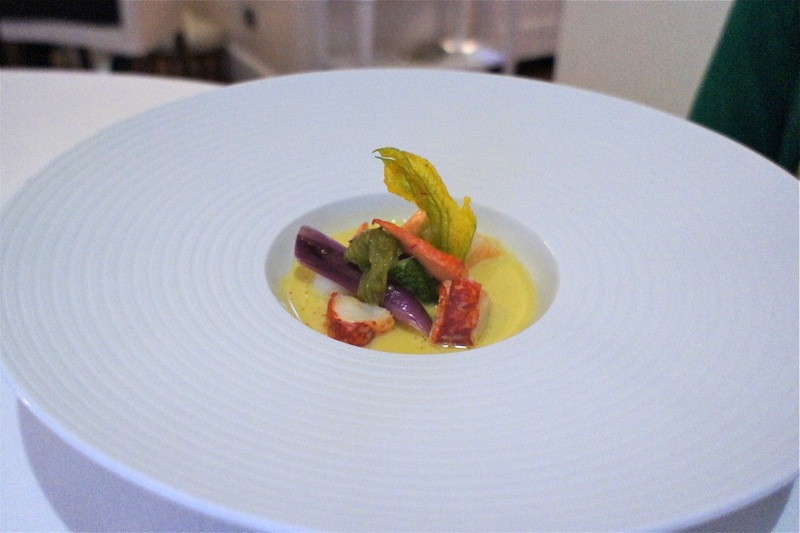 Saffron, Vegetables - My wife really liked this, she thought this was one the best lobsters she had ever eaten. Cinta Senese Suckling Pig: Porchetta, Leg, Loin, Cabbage, Cranberries - We both had this (it was in my degustation menu but my wife opted to change her main course to this as well). The Cinta Senese is a breed of pig common to the region. 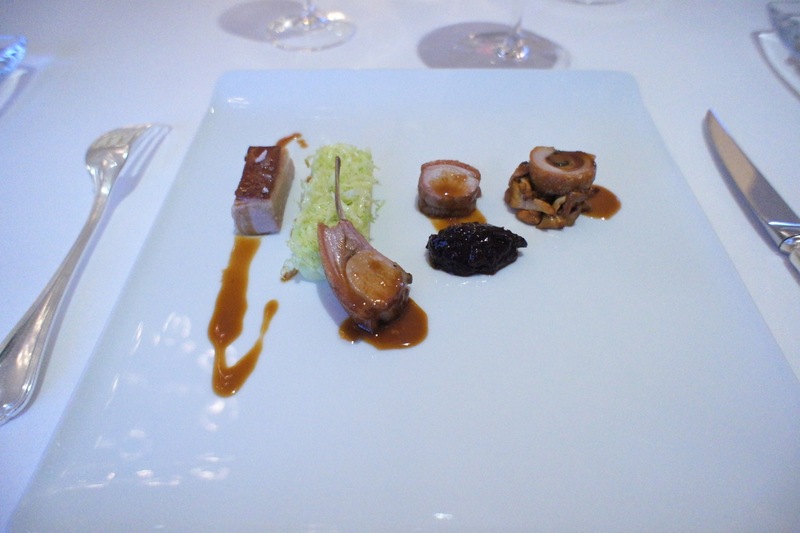 It was pretty good, but not the best pork we've ever had. The sauce was excellent though. 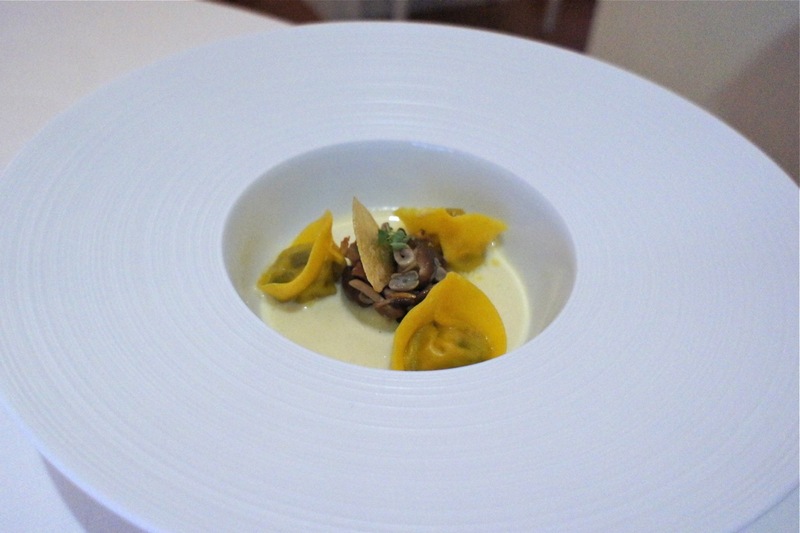 Tortelli, Chiodini Mushrooms, Potatoes from Cetica, Ewe's Cheese - My wife's pasta dish was an al dente stuffed pasta which was accompanied very subtlety by a cheese sauce (which wasn't too overpowering) and very meaty tasting mushrooms. 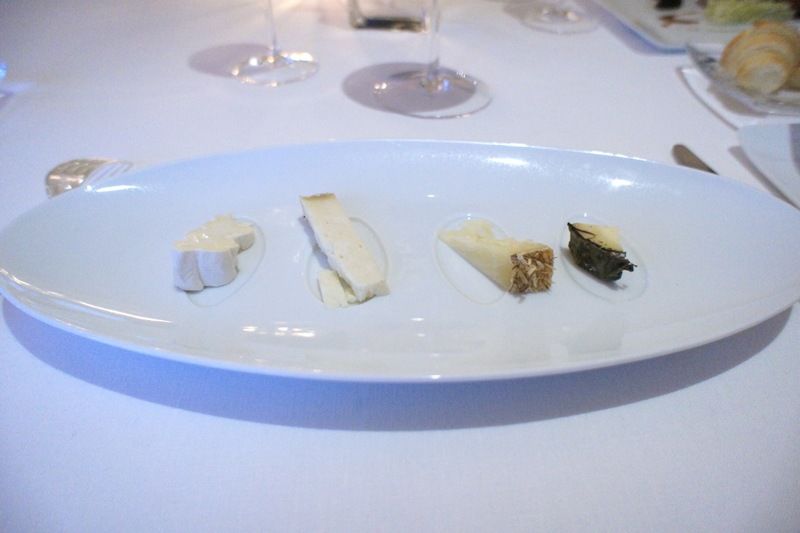 Selection of Tuscan Sheep's milk and Goat's milk Cheeses - I am not a big fan of Italian cheeses and I didn't particularly like this cheese platter especially since it didn't have any blue cheeses. 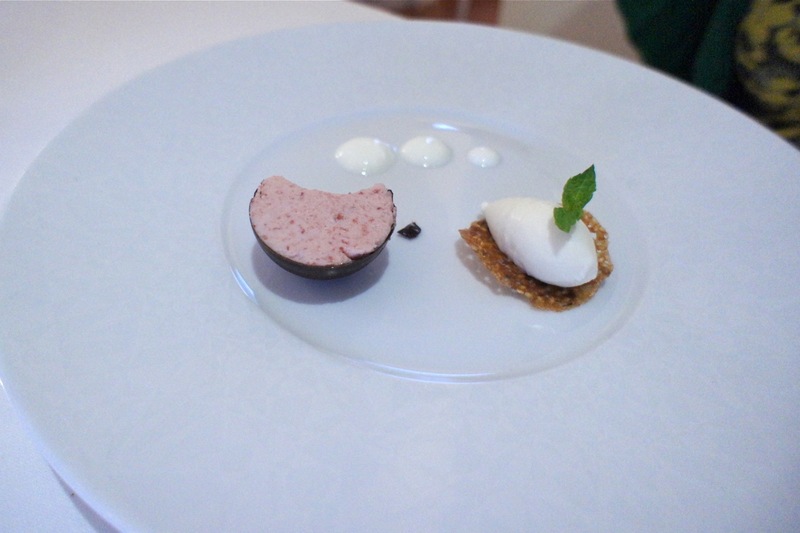 Pre-dessert: Almond ice-cream with chocolate covered hemisphere of raspberry cream - Sublime pre-dessert which could be a main dessert in its own right. Rice, Vanilla, Cantucci, Vin Santo - this was my dessert and was a traditional Tuscan dessert of sticky rice and vanilla cream and some biscotti. It was good but not extraordinary (quite filling though). 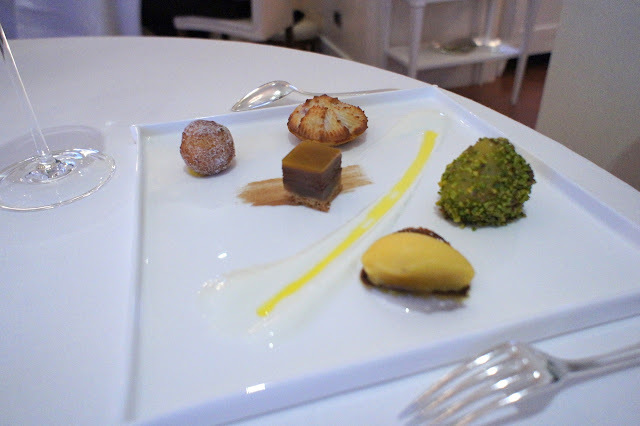 Dessert Assortments: small portions of our selection of desserts - This was my wife's dessert. 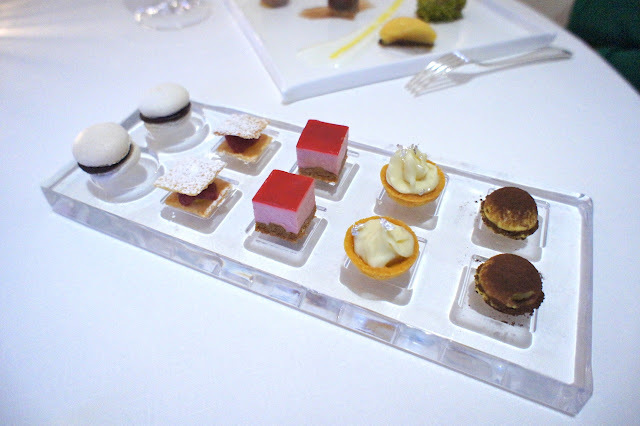 This could have been better served as a petit four and not as a main dessert. Petit four was very good. I loved in particular the marshmallows, but in fairness we were already too full by that point to try every one of them. Final Thoughts: A very good meal and a lovely restaurant, which was helped by a superb wine and wonderful service from the entire restaurant including the chef himself. Good service is often overrated at the expense of the food, but in our experience when the restaurant staff are genuinely happy to have you there and treat you accordingly, it enhances the dining experience immeasurably. Haha, sometimes eating at these restaurants is like that: It's torture come dessert time when you have to finish all that dessert. Just ask Chonks about Venice..